The Royal House of Saxe Coburg Gotha was originally a German house. It was descended from the male line of the Ernestine Branch of the Wettin family tree, German Prince-Electors of Saxony. Members of the House occupied the thrones of a number of European countries, including Belgium, Portugal and Bulgaria. The earliest known member of the Royal House of Wettin was Thiedericus who died in 982. He was probably based in the Liesgau. It’s earliest known ancestors pushed the frontier of Germany eastward into what was formerly Slav territory. They took their name from their castle which was situated on the bank of the Saale river. The name Saxe Coburg and Gotha came to the British Royal Family in 1840 with the marriage of Queen Victoria to Prince Albert . He was the son of Ernst, Duke of Saxe-Coburg and Gotha. However the custom of royals and nobles stipulated that a wife can never gain the membership of her husband’s house, but must remain a member of her own. In this case the Royal House of Hanover, so the throne remained in that house until the death of Queen Victoria. The Royal House of Saxe Coburg Gotha thus ascended the British throne after the death of Victoria, on the 22nd January 1901 by her son and heir Albert Edward – (Edward VII). The House did not remain for long, just sixteen years. Strong anti German opinion during the peak of the first world war in 1917, prompted Edward’s son and heir, George V to change the family name to a much more English sounding one and that of the present British Royal Family, Windsor. So the only monarch to complete his reign in the House of Saxe Coburg Gotha was Edward VII who reigned for nine years from 1901 until his death in 1910. 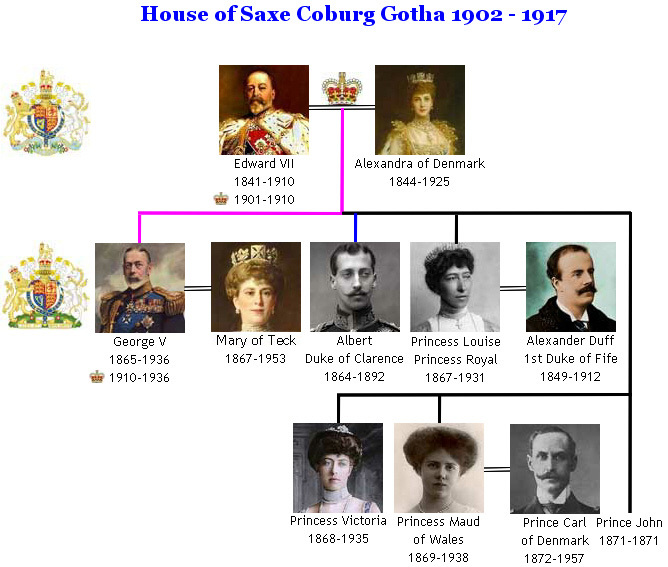 House of Saxe-Coburg and Gotha. A list of the prominent members of the Royal House of Saxe-Coburg and Gotha and their birthdays. If you have enjoyed reading about the Royal House of Saxe Coburg Gotha Family Tree or considering copying my family tree, please share your appreciation by clicking on one or more of the social buttons above – thank you.